A Pennycress Earned . . .
One admirable quality of the West Village is the neighborhood’s strong sense of identity. Historic preservation is highly valued here and the streets reflect the character of the district’s red brick origins. Blacktop and aluminum poles festooned with flyers can be found here like everywhere else in Manhattan, but there are also plenty of quiet streets paved with Belgian block, lined by trees, and flanked by antique lamp posts. One of these fixtures near Jane Street recently drew my attention. I saw a flowering plant spread gracefully before the Art Deco detailing of the lamp’s black molded metal base. The specimen was rooted between the Belgian blocks within one of those surrounding strips of soil I have described as being an urban wildflower haven. Nearby I had photographed Garlic Mustard and saw many examples of Shepherds Purse in bloom there as well. This one plant seemed different; its shape more defined and striking. The main stem did not rise from a basal rosette of toothed leaves similar to the dandelion, so I knew it could not be Shepherds Purse. The shape of the entire plant also had more cohesion, almost like an actual bush, and the alternate toothed leaves were narrow and lanceolate. The flowers were white and possessed four petals like many mustard plant species, but the seed pods radiating below had shorter stems, were set in tight rows, and revealed a geometric symmetry that resembled a bristle brush. I took a closer look at the pods with my loupe. Another physical difference convinced me I was on to something new. The seed pods had a distinctive oval shape with a notch at the tip. The Garlic Mustard has long, threadlike pods called silique. Those of the Shepherds Purse are more widely spaced and, as I wrote in my essay on Capsella bursa-pastoris, resemble “a creased heart served on a stem.” The ones extending below the blooming tips of the mystery plant were rounder, resembling the shape of a fried egg, over easy, served on a stem. This smaller seed pod, usually not more than twice as long as wide, has a formal name of its own: silicle. The basic flower structure convinced me I had found another variety of Brassicaceae growing wild in the West Village. 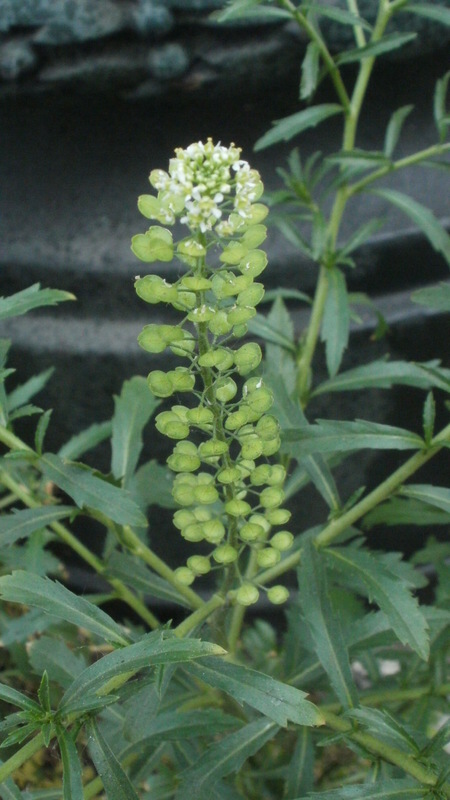 A small problem was the large number of members in the genus Capsella and genus Lepidium. My print references offer only a few illustrated examples so I turned to the Internet and attempted various searches using descriptive phrases that fit the plant in question. The shape of the seed pod was the most obvious feature on which to focus. My searches and some time spent in comparative plant anatomy directed me to Field Pennycress, Thlaspi arvense. 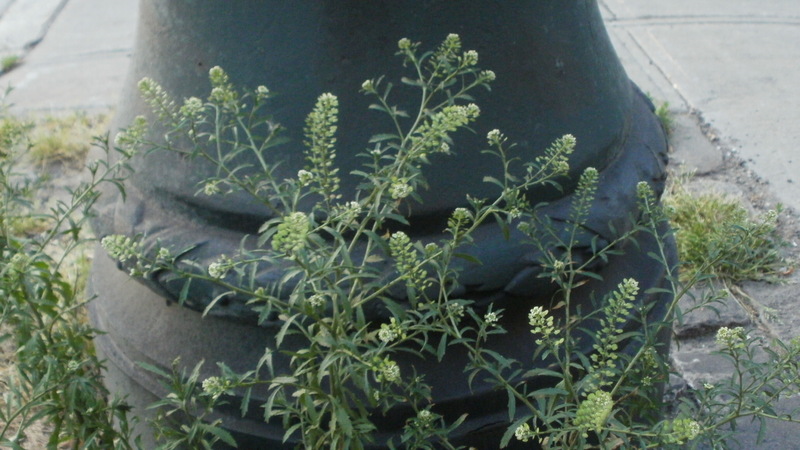 A native of Europe, Field Pennycress is an annual that reaches two feet in height. The plant has minor value as a spice and salad ingredient and has been used as a source for biodiesel production. The stem: Is it smooth or hairy? The leaves: What shape; simple or compound; and how arranged on the stem? The flower: What color; how many petals? The fruits: Shape; location; orientation? Field Pennycress presented all of these nuances, and a few more. 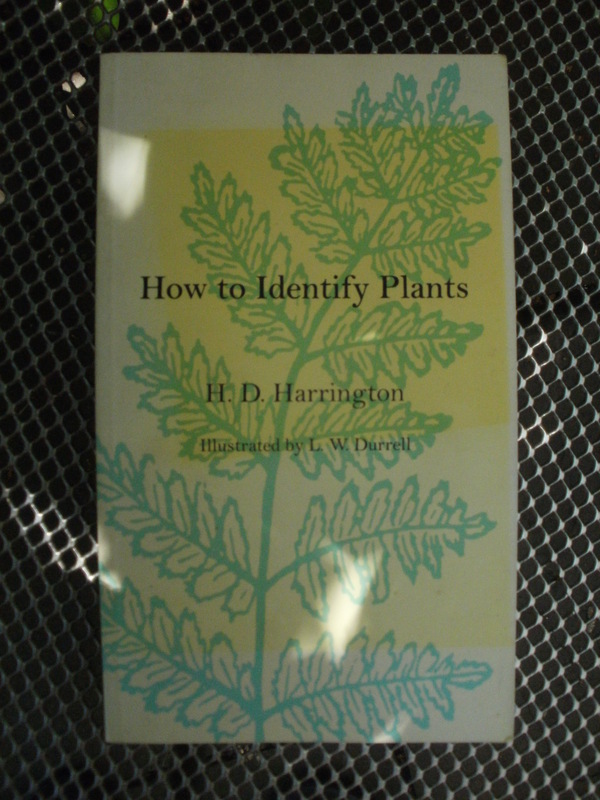 There to assist me was a fine reference, How to Identify Plants by H. D. Harrington. Published by the Swallow Press Books imprint of the Ohio University Press, Harrington’s reference, complete with black and white line drawings by L. W. Durrell, provides me with technical help in narrowing down various physical features and terminology. The only easy part of this exercise was discovering the plant in situ, as it made a striking appearance along the historic front of a Manhattan street. The rest of the process was work akin to a class assignment, making this wildflower of the West Village a penny(cress) earned!